Search for the latest condos for sale in Destin Harbor Resort West on Holiday Isle in Destin, FL. Learn more about this community with our local Destin Harbor Resort Guide. Explore other coastal towns, or other Holiday Isle condos and listings. 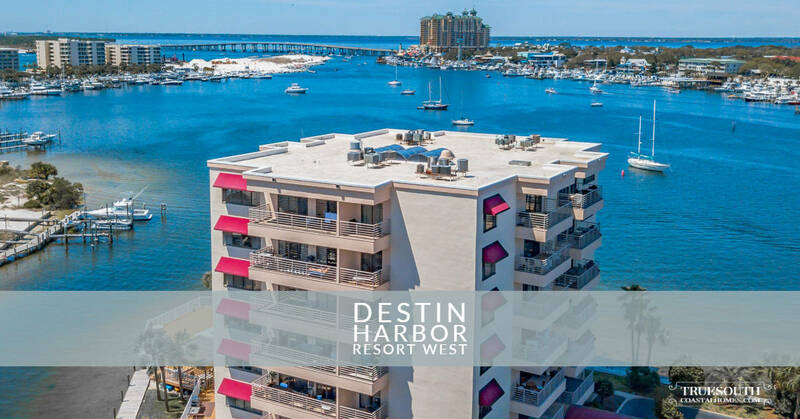 Destin Harbor Resort West is a condominium on the north side of Holiday Isle at the end of Durango Road. You can drop the "West" in the name though, as Destin Harbor Resort is the common name. Its neighbors to the east are Harbor Lights and Sun King condos. Residents here enjoy outstanding panoramic Destin Harbor, East Pass, Bay, and Gulf views. It is a special treat to watch a Destin fireworks show or a sunset from a balcony here. From a dock by the pool, you can call a water taxi to take you and some friends to HarborWalk Village for a night of food and fun in Destin (Top 10 Things to Do). 2019 Update: The lobby and interior atrium are currently under renovation! Also, DHRW will soon share a new security gate with Harbor Lights and Sun King (est. 4/1/2019). The building itself is seven floors and was constructed in 1986. There are four stacks for a total of 24 units. There is a 2-bedroom floor plan unique to each stack; although, some units have been remodeled with a third room. Each condo has two spacious balconies. Amenities include private access to Holiday Isle beaches, a swimming pool overlooking the harbor, outdoor grills, ice machine, golf cart hookup, owner's storage unit, and gated marina. Another outstanding feature of this property is the association-owned 28-slip marina. Each owner is entitled to a boat slip! Given the cost of a boat slip or storage in Destin, these condos are an exceptional value! Short-term rentals and pets are not allowed. Click here for driving directions: 223 Durango Road, Destin, FL 32541. The listings on this page include condos in Destin Harbor Resort West on Holiday Isle in Destin, Florida. If you’re interested in scheduling a showing or learning more about any one of these homes, simply fill in your contact information and click the “Request More Info” button. Our team is here to provide you with any information you need, including disclosures, the sales history of a property and nearby market data.